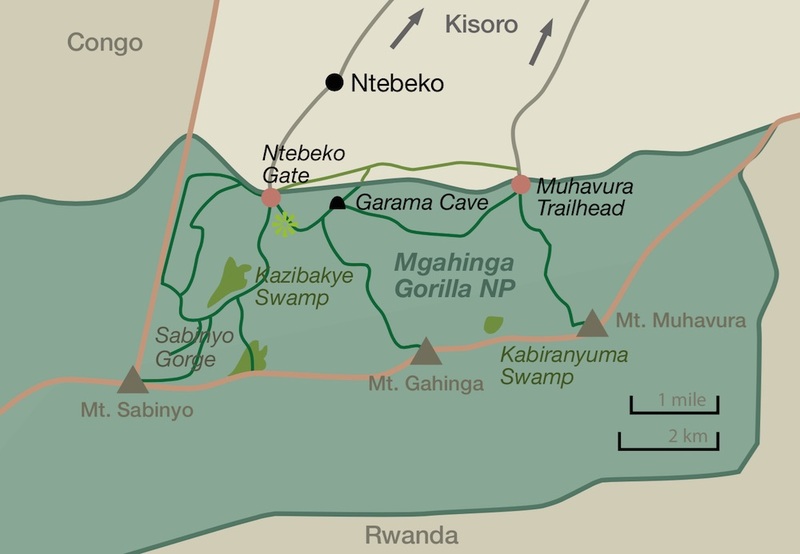 The Gorilla Highlands region encompasses five dormant volcanoes protected by Mgahinga Gorilla National Park (Uganda) and Volcanoes National Park (Rwanda). This is where mountain gorilla research began; it was established much later that gorillas also populate Bwindi. Mt Muhavura (4,127m/13,500ft) and Mt Gahinga (3,474m/11,400ft) can be climbed from either Rwanda or Uganda. You cannot, unfortunately, start hiking in one country and finish in the other. All tourist activities are completely separated and there is no direct fully-tarmaced road connecting the national parks on both sides of the border. It therefore makes sense to do decide for one of the two. From Mgahinga NP you can do Mt Sabinyo (3,669m/12,000ft), a dormant volcano that is on the Uganda/Rwanda/Congo border but not commercially climbable from any other side. From Volcanoes NP Mt Karisimbi (4,507m/14,787ft) and Mt Bisoke (3,711m/12,175ft) are accessible and there are shelters for overnight stays. All hikes in Uganda are day trips. 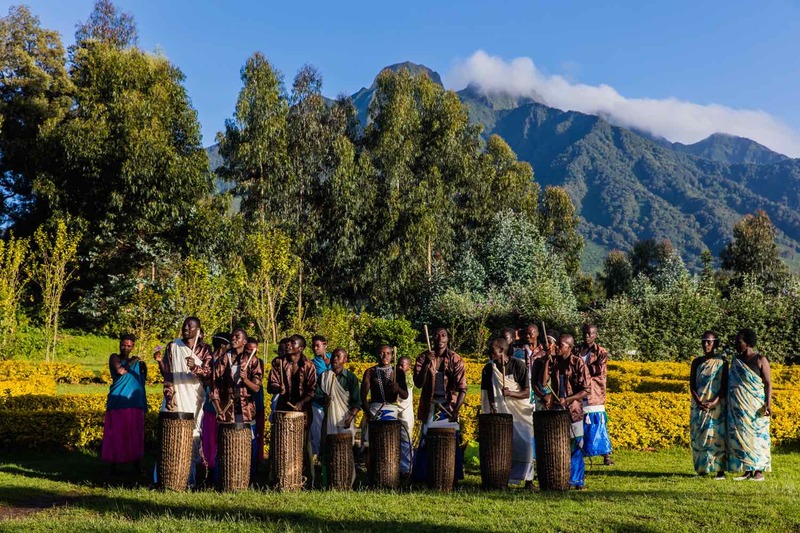 Uganda’s specials are a trek into the pretty Sabinyo Gorge and the Batwa Trail, a costumed “Pygmy” activity. Rwanda, on the other side, gives you an opportunity to visit the grave of Dian Fossey. Gorilla and golden monkey tracking can be done in both Rwanda and Uganda. The volcanoes further extend into the Democratic Republic of Congo where Virunga National Park lies. In 2014, this park was a subject of a documentary that won over 50 international awards and made the area globally known. If you saw the movie, you will understand why we have not included Virunga NP in the Gorilla Highlands region and why we use the term Virungas sparingly. 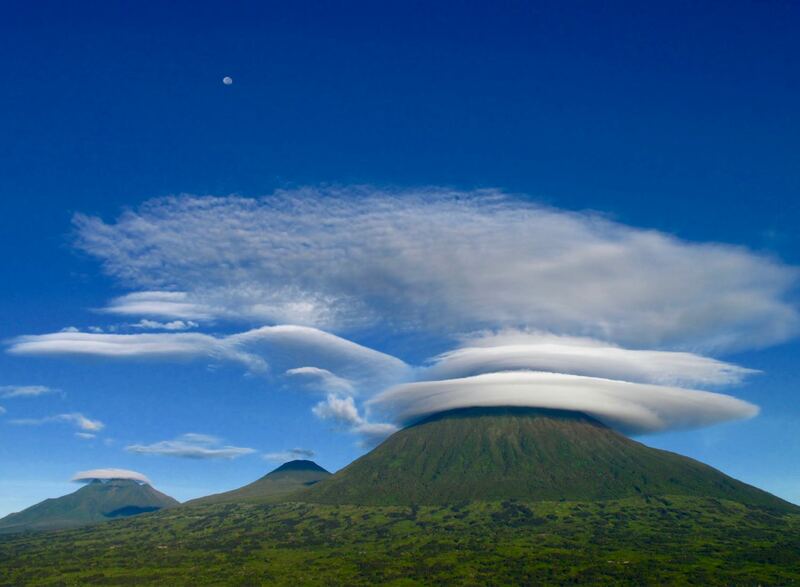 The Virunga Volcanoes is otherwise the geographical name for the eight volcanoes in Congo, Rwanda and Uganda. Whenever that eastern part of Congo is safe, we are happy to promote visiting the rim of Mt Nyiragongo, the mind-blowing active volcano, and doing other Virunga NP activities. Mgahinga is Uganda’s smallest park (33.7km²/13mi²). It was initiated as a game sanctuary in 1930. Its size was reduced in the following decades to placate locals in need of land to cultivate. When a national park was established in 1991, over 2,000 farmers had to relocate. A stone buffalo wall was completed in 1997 to successfully prevent crop damage. The nine-member Nyakagezi mountain gorilla group was habituated in 1992. In old books and on outdated travel forums you can read that they like to cross to Rwanda; in reality that has not happened for years. Accommodation is available at Ntebeko Gate: a community guesthouse and an upmarket lodge, but no mid-range options. Many visitors thus stay in Kisoro and drive to the park (about 45 minutes). Gorillas are usually tracked from the Muhavura Trailhead but depending on their position Ntebeko Gate can also be a tracking start point. The Uganda Wildlife Authority office in Kisoro Town will direct you accordingly. Park entry costs USD 40 for non-residents, USD 30 for residents and UGX15,000 for East Africans. Children (5-15 years) pay USD 20 if they are non-residents, USD 10 if they are residents and UGX5,000 if they are from East Africa. School groups are charged UGX2,500 per student. Volcanoes National Park measures 160km²/62mi² and was established in 1925 to keep mountain gorillas safe from poachers. It achieved international fame much later, in the 1970s, following the work of Dian Fossey. During Rwanda’s troubles in the 1990s the park was closed and reopened in 1999. 10 gorilla groups have been habituated, allowing 80 people to visit them on any given day. There are abundant accommodation options in Kinigi, the village hosting the park headquarters. Nearby Musanze Town has even more hotels of all price brackets. Tourists unable to hike long distances should try to book the Susa gorilla family that tends to be the closest. Bwindi is a lush rainforest set in a rugged landscape, measuring 331km²/128mi² at an altitude between 1,160 and 2,607m/3,800 and 8,550ft. This island of biodiversity is very old; forests elsewhere in Africa mostly disappeared as a consequence of the arid conditions 12,000–18,000 years ago. Later on Bwindi survived two millennia of farm clearances by Bantu farmers. 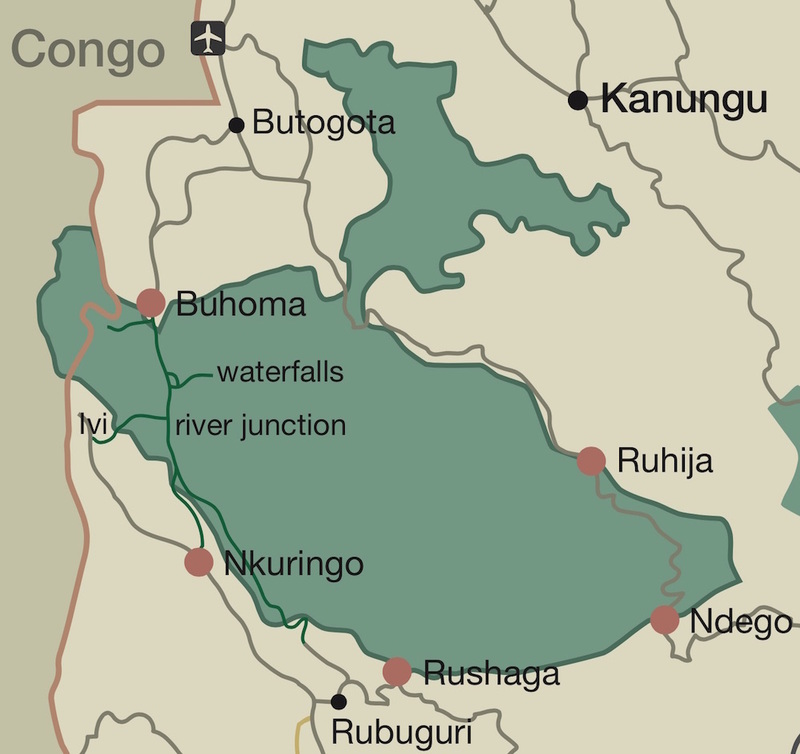 The Virunga, Echuya and Bwindi forests became separated around 400 years ago. Some parts of Bwindi were first gazetted in 1932, and it was eventually made a national park in 1991. Since 1994 it has been a Unesco Natural World Heritage Site. It protects 200–300 tree species that are unique to the African rainforests, many of which don’t have English names. Under their canopy, one can look for 28 species of amphibians and 28 reptiles (14 lizards and 14 snakes), at least 200 butterfly species, 350 birds species (184 are forest birds and 23 Albertine Rift endemics) and 120 mammal species (49 large and 71 small—16 insectivores, 39 rodents and 16 bats). 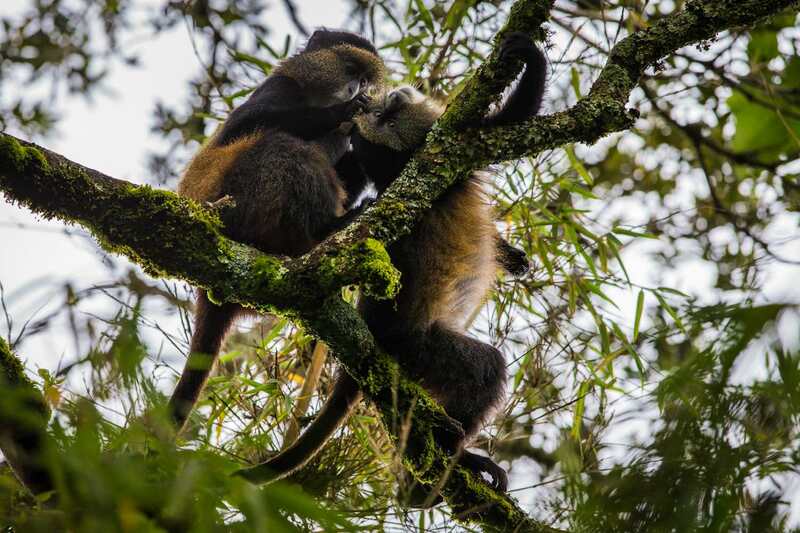 The 10 primates among them are mountain gorillas, the vulnerable mountain (L’Hoest) monkey, red tail monkey, blue monkey, black and white colobus, olive baboon, the chimpanzee and some secretive nocturnal species about which little is known. The northern sector of the forest is at a lower altitude and is comprised of closed canopy forest with little undergrowth. The southern sector is at a higher altitude and is less dense; it has many open areas created by elephants and humans. • Rushaga: largest number of habituated gorilla groups, occasional visits of elephants. Park entry costs USD 40 for non-residents, USD 30 for residents and only UGX15,000 for East Africans. Children (5-15 years) pay 20 if they are non-residents, USD 10 if they are residents and UGX5,000 if they are from East Africa. School groups are charged merely UGX2,500 per student.